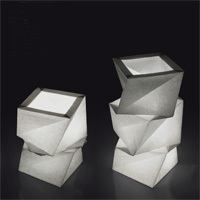 On the this years’ Light & Building fair, the Japanese fashion designer Issey Miyake presented the lamps collection IN-EI, which is going to be available from November 2012, together with the Italian lamps manufacturer Artemide. “When you see them, you can’t help feeling moved; when you understand them, you are full of wonder seeing a future we thought unreachable and couldn’t imagine this beautiful”. Ernesto Gismondi introduces IN-EI ISSEY MIYAKE’s lighting, as conceived by Issey Miyake and his Reality Lab., and brought to life by Artemide. from a collaboration with Artemide marrying their lighting expertise with the Lab.’s innovative approach to the material and design. “I am extremely proud of this collaboration”, Ernesto Gismondi explains; “Issey Miyake devotes his extraordinary artistic commitment to a quest dedicated to men’s needs and existence. The same commitment you can see in The Human Light, Artemide’s mission and philosophy. We share Miyake’s values and visions”. 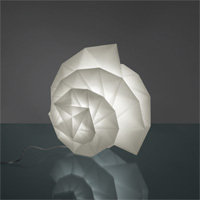 combines the Japanese tradition of light with Miyake’s unique ability to translate tradition into modernity. Artemide animates these sustainable and striking shapes using LED lighting, today’s most relevant sustainable technology. 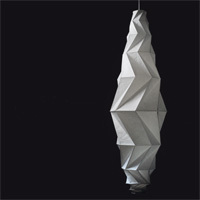 The IN-EI ISSEY MIYAKE lighting collection was co-developed and manufactured by Artemide. It is a collection of free-standing, table and hanging lights. Each lampshade is created using 2 or 3D mathematic principals, where light and shade harmoniously alternate. Miyake’s unique folding technology creates both statuesque forms as well as sufficient solidity. The structure of the recycled material, together with an additional surface treatment allows these shades to perfectly keep their shape without the need for internal frame, and to be re-shaped when needed. They can be easily stored flat when not in use. The innovative meaning of the “132 5. ISSEY MIYAKE” project lies in its numbers; 1 refers to the one-piece fabric used for each product; 2 comes from the 2D initial folding process; 3 refers to 3D; 5, preceded by an empty space, refers to the metamorphosis turning folded shapes into clothing or objects. Five also is an auspicious number, and represents the desire for the clothing or objects to continue to assume new dimensions in the future.